So I am starting to feel the diet a bit today. I have officially lost weight already and furthermore my drives to work are filled with the sounds of my tummy yelling for my oatmeal. I had the apple today, used a pinch less water and had it sit longer. Voila! Perfecto! 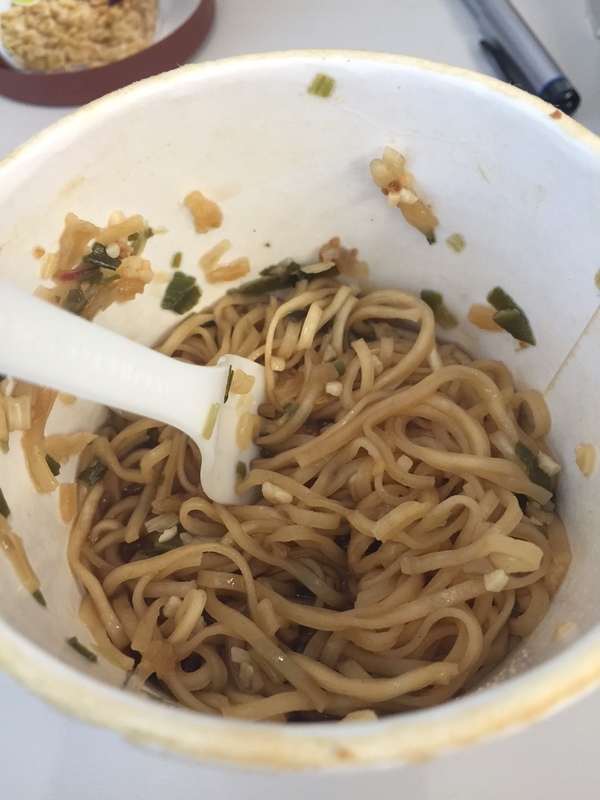 As for the lunch time meal I chose, I picked The soy ginger noodles. Again, I was wanting to put peanut butter in them and make them a satay flavor but I held back sort of. I waited until I ate most of them and then seeing they were only 200 calories added a tiny bit just to try it out and they were phenomenal still. I know I know, don’t alter but don’t you want to know your options if you want to spice things up? I know I do! So here is my full review (before I started adding peanuts). So overall? Again, a winning day. I am feeling like I am on a lucky streak and afraid that I won’t like the next days lunch because the odds are against me now. I am bound not to like something I would think. But hey maybe not maybe everything from this group will turn out to be delicious. Like diner food is always delicious. I don’t think I have ever had a bad meal at a diner. So we are on Day 2. Last night, I had a portion controlled dinner including thai curry seitan with grains that was just so yummy and 350 calories so definitely staying on track! I wasn’t sure I could do it with leftover pie in the house but I did 🙂 .Today we started the day off with the Organic Maple Whole Grain Oatmeal. I figured this was a safe bet. 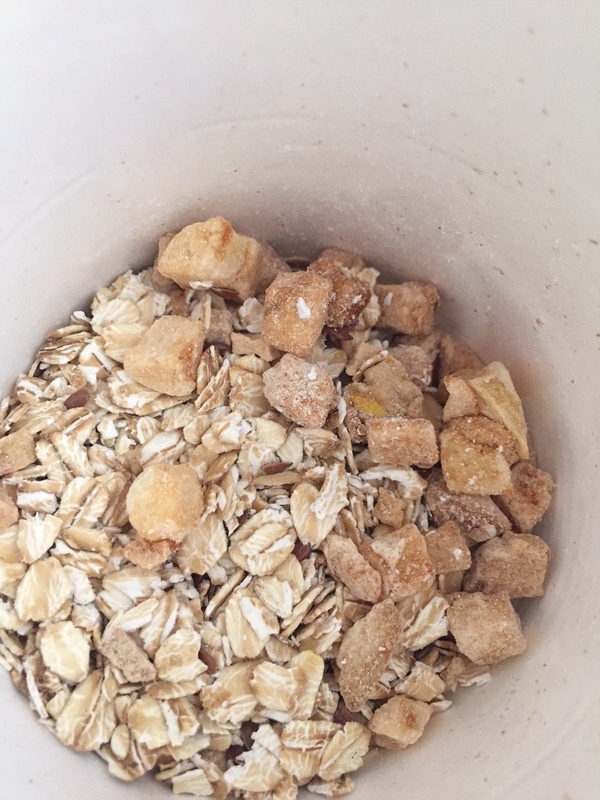 Everyone loves simple oatmeal with maple syrup. I, as a New Englander, have that stuff running through my veins after a childhood of nothing but that for breakfast every morning in the winter and my grandmother would put a splash of milk on top to cool it down. Who knew then I was allergic? That being said. Let’s analyze Day 2! Day 2 started out challenging because I was STARVING by the time I got to work. I had a hot coffee and my oatmeal and put in a splash less boiling water and the oatmeal came out freaking perfect! Fluffy with a chew and awesome. I loved the maple flavor. it didn’t taste fake or artificial like a fake sweetener. I got full less than halfway through and I take into account not only the heat of my office window but the coffee and oatmeal being hot as well. The oatmeals are just so filling I am not sure what this company does but its magical. I was still picking away at it an hour later because I was full but wanted to stay that way all day. Definitely a winner, I think I liked it more than the apple. FYI this is not a cold salad. This is a hot bowl of rice unless you choose to refrigerate it later which honestly sounds just as good as when I ate it hot but would take longer at work and well I am hungry by lunch. This meal is super filling and amazingly delicious. I loved the light curry flavor and the surprise sweetness when I would get a piece of dried fruit or crunch an almond. Sooo yummy. I wish I ordered more of these now so I could but some in the fridge as snacks. We are going away this weekend and this would’ve been the perfect food for lunch stops. I can’t eat much at those roadside places and honestly I don’t even want to because who wants a belly ache of burgers and fries on a long drive? Not me. The downside of this meal is only 1 thing. The smell of the curry may linger on your hands if you get some on you. Which I did. Because I am a mess. It gets a little strong later in the day and you have to wash your hands a few times. Otherwise enjoy the curry goodness. This was delicious! So I decided that it was time to lose the rest of baby weight and get back to my blog now that my daughter is big and healthy and all that fun stuff. Although, I am a little concerned that she is actively trying to kill herself daily or be a stunt woman in Hollywood with her crazy attempts to leap off things and roll towards tile floors. I may need to invest in a baby inflatable sumo suit. Do they even have those? I digress. I looked up about a million “vegan” food plans including but not limited to Beyonce’s and ones claiming to be vegan friendly but were really just vegetarian. Most were overly costly, made me add my own fresh veggies (umm isn’t that the bulk of the meal? ), and didn’t ship to where I live since none are in Boston. I needed something like Weight Watchers for vegans without the meetings unless they include a Mommy and Me Yoga class after work hours, then I would be in but that doesn’t exist. Maybe just… Easy, accessible, and I can bring it to work? Well I did get somewhere eventually. 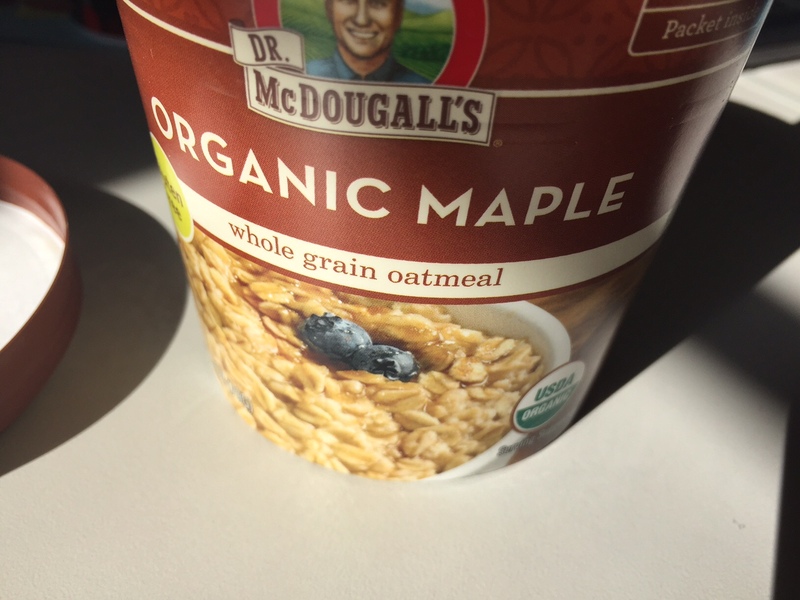 I found Dr. McDougall’s Right Foods and ordered a bunch of stuff after looking at the prices and options and rolling over in my mind a dozen times if I was really ready to deal with this, I would have to give up my morning bagels eventually I guess. @RightFoods have what seems to be a million options of foods and for $65 (roughly and I paid like $20 for fast shipping because I wanted it sooner than like 10 days or whatever), I bought 12 packages of breakfast oatmeals and I think 14 lunch meals. That being said it’s like $5 a day for breakfast and lunch. Probably closer to $2.50 a meal which I think is like a dollar or two less than a weight watcher meal and I got two for $5 and they weren’t even on sale 🙂 . So I am a happy camper in my wallet. Now it is time to eat this stuff. Will I be hungry? Will it be bland? Gross? Funny smelling? I am basically fat right now in my opinion (and probably the opinion of my doctor, scale, and BMI too but not my husband because he wants to sleep in the house not the shed tonight) and before my darling babes I was a runner, yogi, and surfer so I know I need fuel for exercise not just weight loss. I need to be not hungry after I eat my meal or I will fail at this and eat more than just an orange or two, I will eat that bagel and then I will have had two breakfasts which is worse than before. So let’s see how Day 1 went this weekend in my test. Have you had experience with any vegan meal plans? Tell me about them in the comments! First, I put the whole sugar packet thing in it which is optional but in my opinion, it is not optional. I found it didn’t even feel very sweet with it in it. I do have a sweet tooth so this is probably saying its a little sweet but it was still tasty and I enjoyed it. The fill line could’ve been a little lower or maybe I should’ve microwaved it a bit instead of just adding hot water. Not sure but it was a little watery. However, that was no matter because about 3/4 the way through I was full and I mean like “wow there is still more in there? I am not sure I can finish” – full. But I finished it and I was full all morning, maybe a tiny overfull but in a good healthy way. Gefore I would eat a big multigrain bagel with earth balance and still be starved and it was wayyy more calories and fat. The meal itself was very hearty. 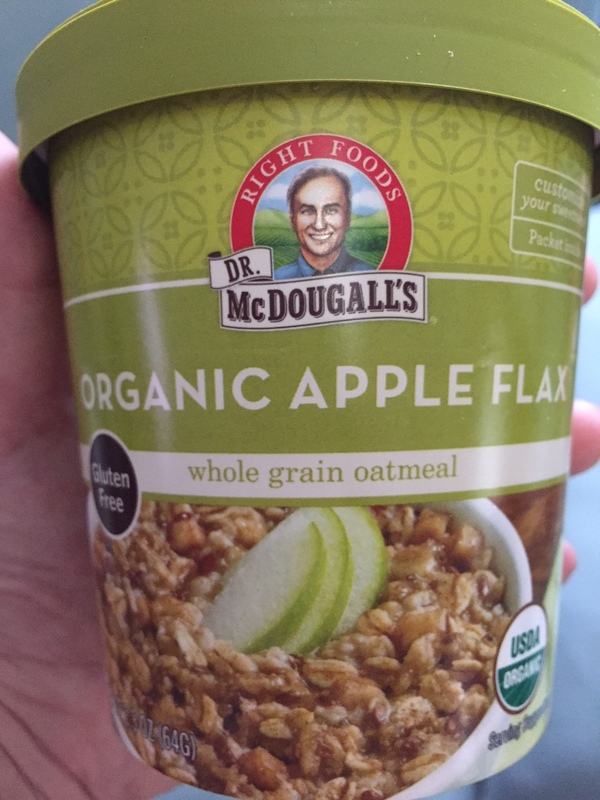 You definitely get apples and flax and oatmeal. I mean you can see the chunks of everything and it’s great. 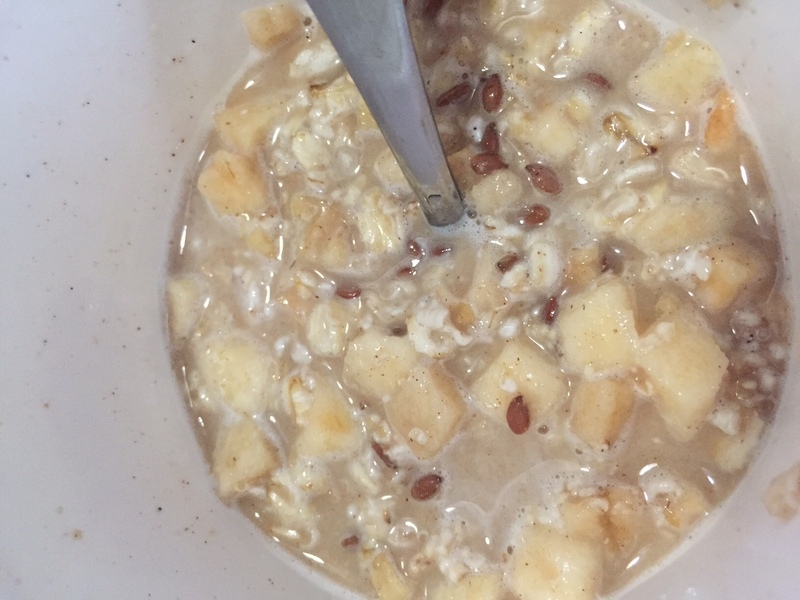 You feel like you made it and chopped it yourself not like a traditional oatmeal packet of barely there freeze dried apples that are sponge-y. So kudos to them on this. It was a success over all. In the end, double success on Day One. Or as my Chinese food menu may say Double Happiness :). Lunch: Curry Almond Brown and Wild Rice Salad. I love love love my Aunt Linda’s Taco Salad. Everytime we would have a family event at my Dad’s parents home in southern Massachusetts she would seem to bring this very simple Taco Salad with her despite the fact she is a trained chef. You would think a trained chef would bring something more severe and fancy but nope, Taco Salad. Here is something I can tell you though, this is the best Taco Salad in the universe and if you are a trained chef and you want the masses to eat salad, this is the salad you bring! It is salty, sweet, hearty, and healthy all mixed together and thanks to Beyond Meat I can now make it VEGAN! (Insert personal dance party moves here). So grab this for the next potluck, Meatless Monday, or Taco Tuesday. You won’t be sorry. Bravado aside here is the recipe. Enjoy! Chop and shred lettuce and place 1/2 in a bowl. Chop tomatoes and place 1/2 in a bowl. Add 1/2 of the crumbles to that bowl and mix. Then add remaining crumbles, lettuce, tomatoes, and toss until well combined. Add Catalina dressing until covered like a Caesar salad. Crush Fritos and add at the last minute and toss. Happy New Year. Food is Love. Take a vacation with my daughter. Go to church more and really find a spiritual center than I can pass on to my daughter, whatever that is. Meditate more. I find peace and rest in this but hardly do it enough. Use more whole foods and whole grains in my meals and recipes. Bake my own bread more often. Read to my daughter more. My favorite book right now to read to her is “My Mom Eats Tofu”. It makes me smile and laugh. Organize my kitchen and my spices. Declutter everything in my house. Start running again. That jogging stroller isn’t going to jog my daughter around on its own! Learn to use my paddleboard. Learn to let go of things. Read more books for joy after work rather than watch tv. Teach my stepkids to surf. So those are them. I may find that some aren’t feasible this year, or all are and add more, or even tweak the ones I posted, but here is to another wonderful. hope-filled year ahead of us. I hope everyone’s dreams begin coming true with the drop of that crystal ball in Times Square. So I had a baby. Now I have no time. So I use MANY vegan life hacks (5 recipes included)! I had a baby a few weeks back. I was very ill before that causing a HUGE lull in my blogging and quite honestly my eating as well. I developed preeclampsia and could barely eat anything or walk, before that I got C-Diff… again no eating mostly doing the opposite of eating. I was the worst pregnant lady ever. If I was glowing it was strictly from swelling and fever. Thank goodness that is over. And let us welcome my vegan baby Solana Bray! 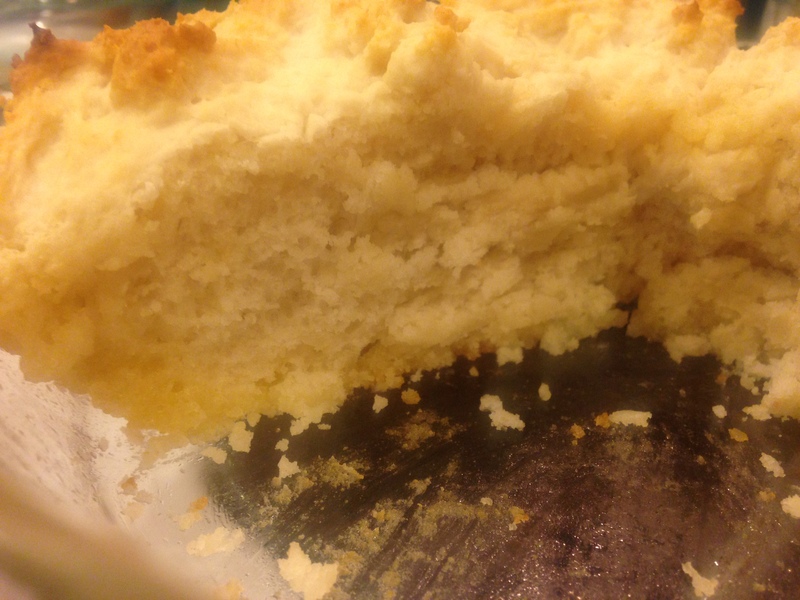 That all aside… I am getting back into my kitchen. Cooking when I can. Thinking of new recipes and enjoying my short moments of quiet when they come. 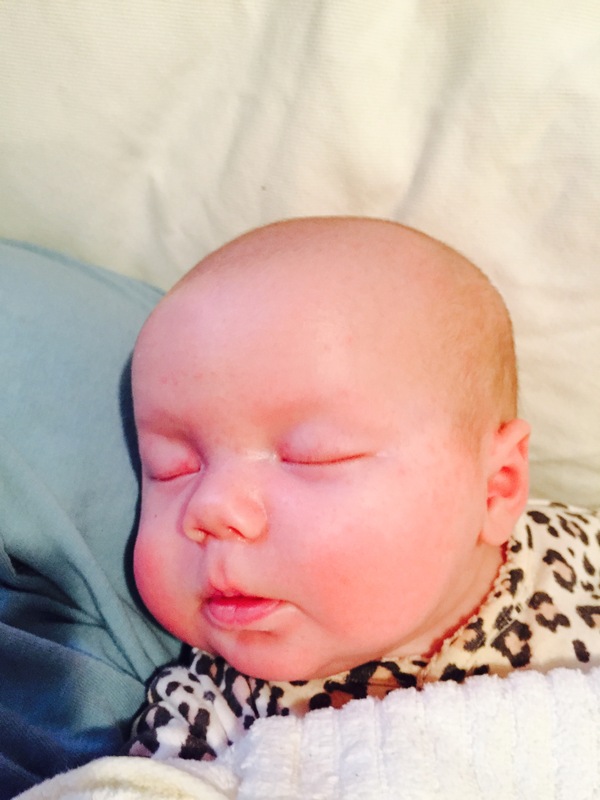 The baby is out of the NICU (newborn intensive care unit, she was only 3lbs at birth but look at those cheeks now!) and at home so these moments are rare nowadays and my two stepchildren came to live with us in August. I think it is easy to tell that things have been hectic. So today I wanted to share some of my yummy vegan life hacks that I have been using to get through meal and snack times after work and on the weekends. Peanut Butter Cookies: Use Betty Crocker Peanut Butter Cookie Mix and then sub out eggs with Egg Replacer. They come out perfect. I also use a silpat instead of cooking them directly on a cookie sheet because they are a little more crumbly. Let them sit for a few minutes before serving or else they fall apart. Cinnamon Rolls: Use Pillsbury Crescent Rolls and don’t separate them at the triangle perforations or buy the dough itself if you can find it. They spread with Earth Balance Buttery Spread and sprinkle with cinnamon, brown sugar, and Penzey’s Vanilla Sugar. Roll up and then cut into 8-10 mini rolls. 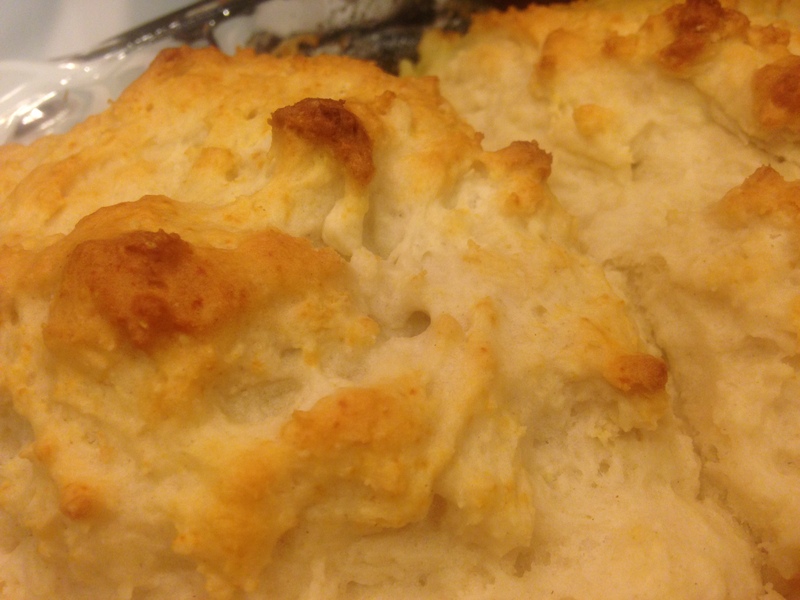 Bake for about 8-10 minutes until browned. Again, I use a silpat because they get sticky :). Cheese Quesadilla: Grab some tostadas from the Mexican section of your grocery. I prefer Maizada. Top with crumbled Daiya Jalapeno Havarti. Microwave for about 30-45 seconds and top with another tostada and microwave 10 more seconds. Enjoy! Taco Salad: I eat this for lunch almost everyday lately. Chop up 1 head of iceberg lettuce. Add shredded carrots. Toss with Catalina dressing. Then mix in cooked Beyond Meat Feisty Crumbles (I make 2 packages) and crushed Fritos. It will be your favorite lunch, I promise. My step kids adore it as a quick dinner as well! Chocolate Chip Pancakes: 4 cups Bisquick, 3 1/2 cups Silk soy creamer, 1/2 tablespooon of Penzey’s almond extract, 1 cup of Enjoy Life Mini Chocolate Chips. Mix and cook on a skillet sprayed with Pam Canola Oil Spray. These are amazing. As a quick trick sprinkle some Penzey’s Vanilla Sugar on the raw side before you flip it and they are amazing! What a treat! Makes enough for 4-6 hungry people. And there is always this very easily veganized “cronut” recipe to indulge in if these weren’t enough to make your holiday happier! Happy Holidays! Much Love! Food is Love! This is just a perfect recipe to convert the sweets of summer fruit to the warmths of a fall recipe. Emily does such a wonderful job narrating her recipes also so I always love reading her entries. I am looking forward to this on top of some of my homemade vegan vanilla ice cream and a sprinkle of cinnamon!